This guide will be illuminating not just for writers, but for anyone trying to unleash more creative and productive energy. How to Break Writer’s Block Today and Where to Get Ideas by N. M. Beguesse is not your typical book on beating writer’s block. Whereas other books suggest moving through a creative block with a series of writing prompts, this book dives deep into the creative process and the fundamental role of stories in our lives. From the start, the book takes a unique approach to a well-covered topic by redefining writer’s block as a misdirection of the writer’s playful energy and by redefining stories as the transferring of emotion. The text then introduces tools and techniques to capitalize on energy and emotions. Lastly, it centers on how to best generate new ideas by identifying parts of a narrative with intentional emotions, like fear or sympathy. Using the author’s personal experiences as well as anecdotes from the creative processes of renowned authors and creators, How to Break Writer’s Block Today and Where to Get Ideas is effective at repositioning writer’s block as a misdirection of creative energy. For instance, it presents the fact that Beethoven composed beautiful music even after he was stricken deaf as an analogy for the blind trust that writers should place in their inner child’s playful creative energy. Beyond its fresh approach and clear writing, the guidebook is effective because of its series of concrete tools and techniques for writers to follow. For instance, it introduces a “Joy Scale” and a “Productivity Formula” as ways of making sure that writing is more enticing to writers than the activities that often distract them. The text includes rudimentary drawings, flow charts, and diagrams to help illustrate how these tools can alleviate writer’s block. 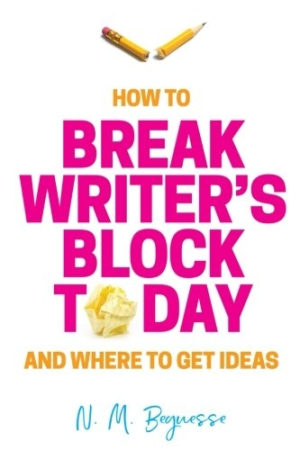 How to Break Writer’s Block Today and Where to Get Ideas stands out among similar guidebooks because it maintains focus on writers’ common stumbling blocks—distractions, hesitance to edit or rewrite, self-confidence, and coming up with new ideas—while also focusing on process. For that reason, it will be illuminating not just for writers, but for anyone trying to unleash more creative and productive energy.